HANCOCK, Md. 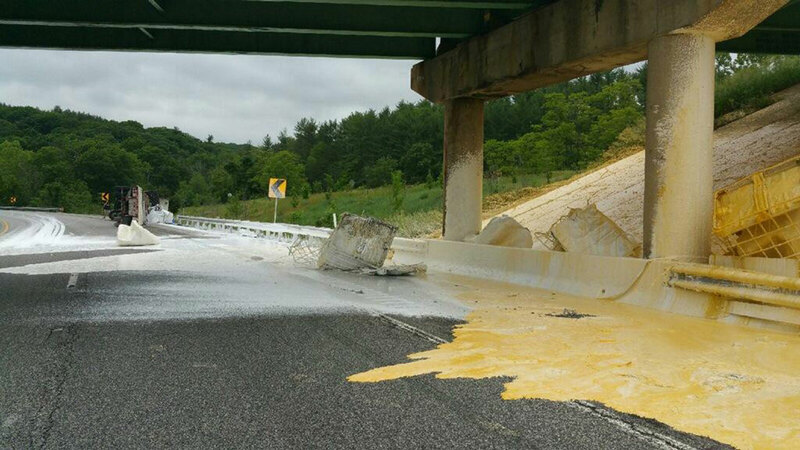 -- Yellow means slow on Interstate 68 in western Maryland, where crews are cleaning up 6,500 gallons of spilled paint. The Maryland State Highway Administration said Thursday the cleanup will continue at least through Saturday night. The agency says one westbound lane will be closed during daylight hours so workers can scrape the road and replace the guard rail. State police say the driver of an overturned tractor-trailer was texting on a cellphone when he lost control of the vehicle Wednesday evening, causing plastic barrels of white and yellow paint to fall and break. Both westbound lanes were closed for nearly 12 hours overnight, backing up traffic for up to 2 miles. The wreck was reported shortly after 6 p.m. Wednesday about 10 miles west of Hancock.